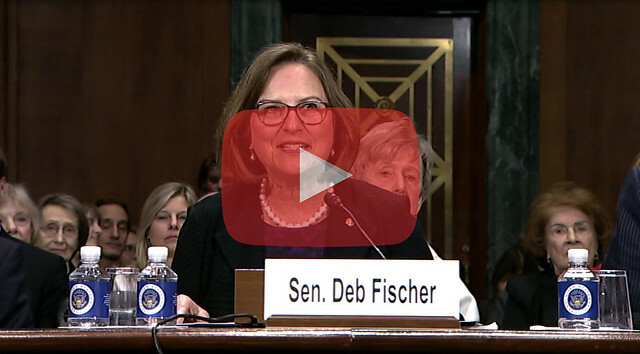 Click here or on the photo to view the video of Senator Fischer’s testimony. WASHINGTON, D.C. – U.S. Senator Deb Fischer (R-Neb.) today introduced Nebraskan Brian C. Buescher at his nomination hearing before the Senate Judiciary Committee. Buescher is President Trump’s nominee to serve as a judge on the U.S. District Court for the District of Nebraska and fill the vacancy on the court created when Chief Judge Laurie Smith Camp entered senior status this fall. Fischer and Senator Ben Sasse (R-Neb.) recommended President Trump nominate Buescher for this judgeship. The full text of Senator Fischer’s remarks on Mr. Buescher’s behalf is below. Mr. Chairman and members of the Committee, it is my honor to introduce Brian Buescher, President Trump’s nominee to serve on the United States District Court for the District of Nebraska. First, I would like recognize his family who traveled from Nebraska to be here with us today. Brian is joined by his wife, Elaine, their three daughters- Elizabeth, Catherine, and Anna, and their two sons – Alexander and Nicholas. Mr. Chairman, at the end of last year, Chief Judge Laurie Smith Camp notified me, along with my colleague Senator Sasse, that she would be taking senior status on the Nebraska federal bench. We knew a careful search process would be necessary to fill her shoes. The U.S. District Court for the District of Nebraska carries a reputation of deep reverence for our laws and the Constitution. Our federal district court has a relatively small bench, but it has a very busy docket. In recent years, Nebraska has had one of the highest per-judge criminal felony caseloads in the country. Additionally, Nebraska’s criminal felony per-judge caseload significantly exceeds those of several districts that encompass major cities, such as Los Angeles, New York City, or Chicago. So it is critical to our state and our country that the district court continues to operate without additional delay. For this reason, Senator Sasse and I quickly began the application process to fill this important judgeship. We announced our open process and considered applicants with wide varieties of excellent legal credentials. Every candidate completed the lengthy questionnaire provided by this committee. And we read over their responses. Nebraska is home to many preeminent and talented legal minds, so narrowing the list of applicants presents a challenge. But after extensive consideration and interviews with qualified candidates, Senator Sasse and I agreed on recommending Mr. Buescher to President Trump to be the next judge on Nebraska’s federal district court. Brian Buescher hails from the small town of Beatrice, Nebraska. His work ethic was ingrained at a young age while growing up on his family’s farm, where they raised corn, milo, wheat, alfalfa, hogs, and cattle. After graduating from Sandy Creek High School and the University of Nebraska-Lincoln, Brian attended Georgetown University Law School. There, he was Editor-in-Chief of The Georgetown Journal of Legal Ethics and vice president of the Student Bar Association. Presently, Mr. Buescher is a partner at Kutak Rock, Nebraska’s largest law firm, where he leads the firm’s agriculture litigation team. After growing up on a farm, he appreciates the way the law directly impacts the daily lives of Americans, especially those who live and work in rural America. Mr. Buescher has represented clients from broad ranges of the agriculture community, including individual farmers, ranchers, and operations. Importantly, Mr. Buescher has successfully litigated cases in a number of different jurisdictions, including Nebraska and Iowa’s state and federal courts, the U.S. Court of Federal Claims, and the U.S. Bankruptcy Court for the District of Nebraska. That wide-ranging litigation experience has honed his legal skills and prepared him well for this judgeship. It represents a commitment we made after entering the union over 150 years ago. Our motto demonstrates a long-standing devotion to ensure that we appoint judges who possess the temperament, integrity, and character to continue Nebraska’s strong tradition of fairness and justice. So Mr. Chairman, this is not a responsibility that I take lightly. Mr. Buescher is a well-qualified candidate and a man of the highest ethical standards. I am confident he will be an excellent judge to fill the vacancy and uphold the Constitution equally and fairly. I know Brian Buescher will make his family, our state, and our nation proud with his service on Nebraska’s federal district court. I appreciate this committee’s consideration of his nomination, and I thank you for allowing me to testify on his behalf this morning.